I still can’t believe this is actually happening. Ever since we moved into this house over 2 years ago, the floors on the main level were one of my least favorite things. 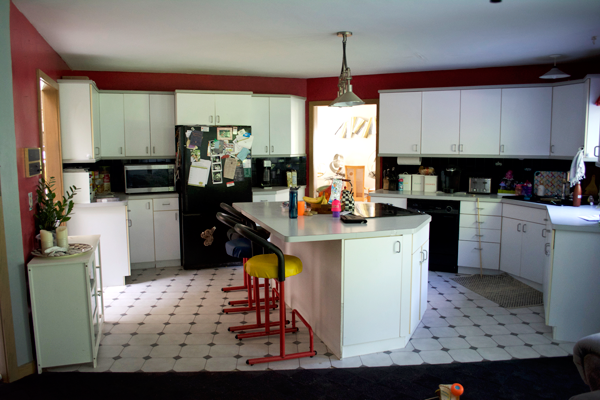 There were 2 different types of tile and 2 different types of carpet including one that was black which as you can imagine with two kids and shedding dog – it literally showed EVERYTHING. I’ve been wanting to rip it out since the day we moved in! Since my FIL still owns this home – we have to get approval from him to do the renovations we want. He’s always been very open to everything and has loved the rooms we’ve done already (laundry room, master bathroom and bedroom). But the main level had kind of been left untouched. There were a lot of pieces that held sentimental value to him and we weren’t about to rip it all out. We respect him and are lucky he’s allowing us to live here with him in this beautiful home. I honestly thought new floors wouldn’t be in the picture for a few more years but when Dan and I brought it up earlier this year, his dad was on board. Once I heard him give approval – I ran with it and never looked back. I started planning as quickly as I could so he wouldn’t have time to change his mind ha. 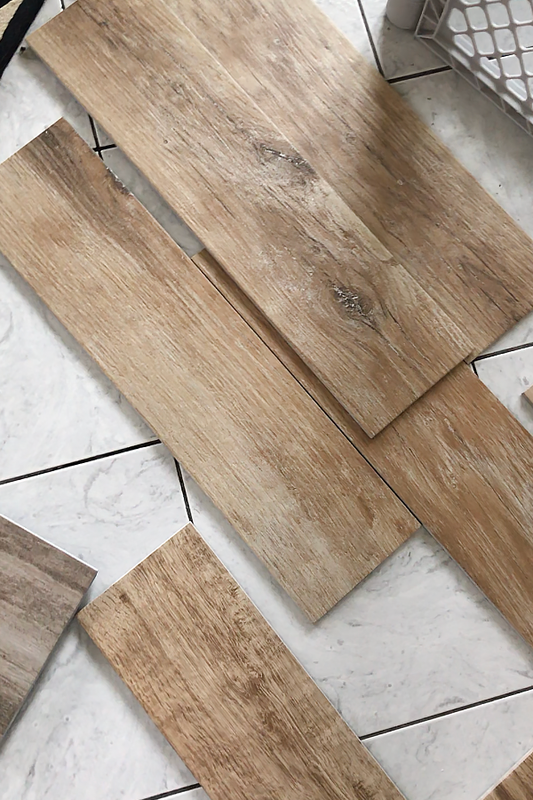 We always kind of knew we would do wood look tile – for a number of reasons. But the more research I did, I found even more benefits that I never knew about. 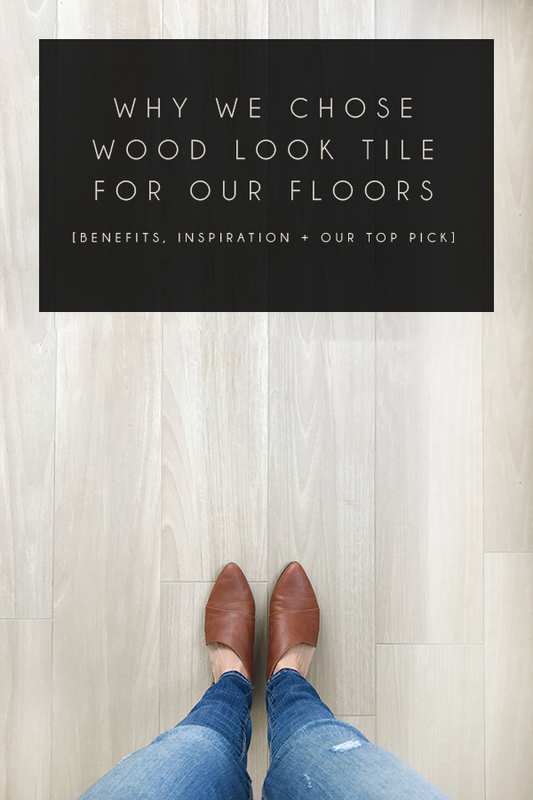 Today I’m going to share all the details of how we made our selection and all the reasons why we chose wood look tile for our floors on our main level. One of the biggest reasons we chose to use wood look tile is because my FIL is in the tile business. He has his own company and has been laying tile for over 30 years. 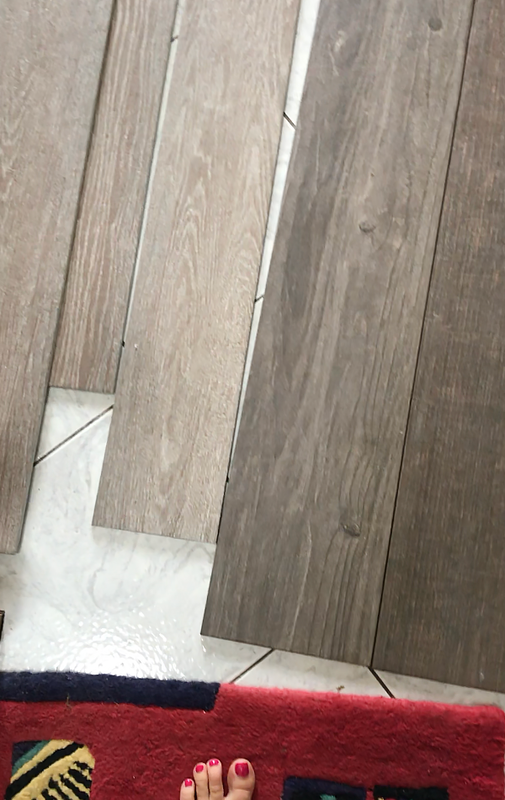 He’s always talked so highly of all the new wood look tile that has been gaining popularity lately which piqued our interest and made us want to look into it more. Of course since he’s a pro he would do all the installation for us which would save us a TON of money since labor alone can be super pricey. So that’s obviously something to consider for yourself, but tile is also super easy to DIY. I’ll be sharing a post soon with loads of tips and tricks from my FIL if you are thinking of tackling a tile job on your own. An obvious reason we went with tile is the durability. 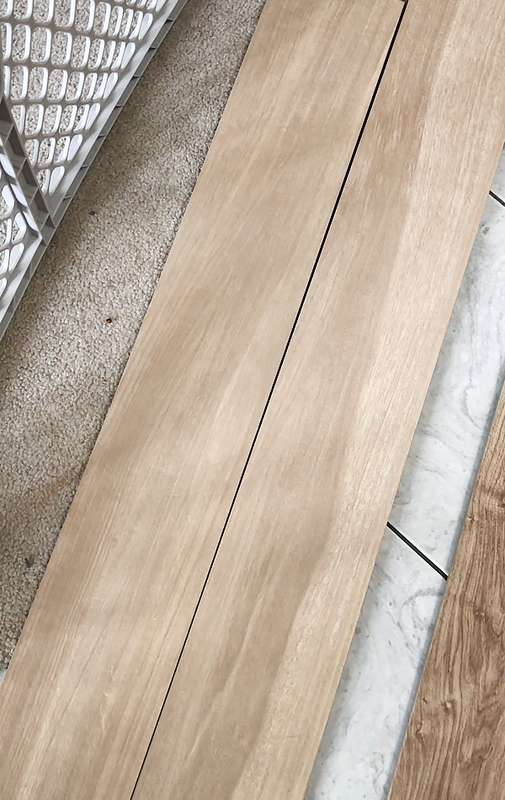 With two little kiddos and one big dog, there’s a lot of foot traffic in our house with toys being dragged all over the floors and Oakley’s claws – we didn’t want to put brand new hardwood floors in and worry about them getting scratched. Tile is made from 100% clay and fired in a kiln at 3000 degrees. If it can withstand that type of heat, you know it can withstand anything. 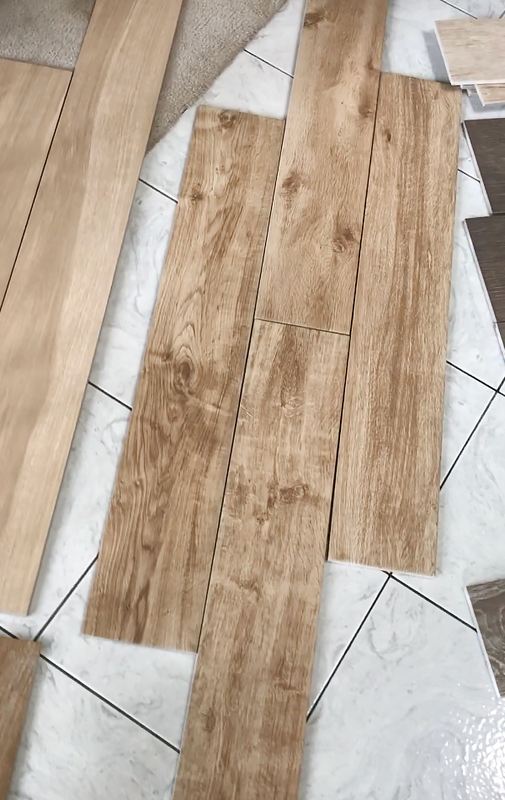 A lot of Marazzi’s tile features ColorBody™ which means the surface and the body of the tile are similar in color so if you do get a little chip or scratch, it will hardly be noticeable. Tile is also chemical and water resistant which allows it to hold up to anything that comes its way. It has a 60+ year long life span – but many times it lasts even longer. We wanted to put flooring in that we could count on for years to come and not have to replace anytime soon. Another benefit of tile is that it’s easy to clean. No need to worry about spilling that glass of red wine – it will just wipe right off since tile is stain resistant. And you don’t need to use any special cleaners – some water and mild soap will do the trick! The only thing you have to worry about with tile is the grout. Especially since we chose a lighter color tile, the grout could potentially get stained. There are a couple of ways you can keep your grout looking clean and new for a longer time. One is to apply a grout sealer which is definitely going to be something we look into it. The other is to use a small brush and some concentrated household cleaner every once in a while to maintain it’s color. That being said though, grout has come a long way and has been made to withstand dirt and stains much more than it used to. I bet you never really considered the health of your floors when deciding what option is best for you. I never realized how good tile floors were for you until I read more into Marazzi’s Why Tile campaign. Tile is actually hypoallergenic and resistant to dust and other pollutants that are known to cause a number of health problems. Being allergen free, VOC free and formaldehyde free are huge benefits I didn’t even realize tile had but make me feel good about the home we’re raising our children in. Carpet and other flooring options are made with chemicals and pollutants that can be harmful to you and your family. They can also be the perfect place for allergens, dust and bacteria to grow. Yucko. Tile is made of all natural ingredients and any harmful residue is burnt out during the kilning process. 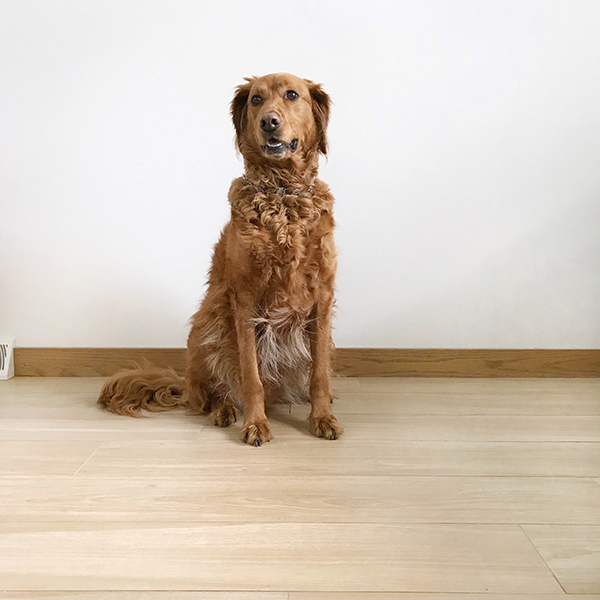 If you’re prone to allergies or asthma – you should think twice about the type of flooring you have in your home – and definitely look into tile! Of course all the underlying benefits of tile are great – but what most of us care about is what it looks like. There are SO many wood look options out these days that many people can’t even tell the difference between real wood floors and tile. With digitally printing technology – emulating the natural stone or wood look is easy. We first put wood look tile in our master bedroom and ever since then I’ve fallen in love. If you want to read more about all the amazing benefits of tile – you can check out more on the Why Tile Initiative. Now for the fun part! I went on Marazzi’s website and picked out a whole bunch of samples for them to send me. It was the best happy mail ever – even though the pallet of samples weighed 400 pounds! I grabbed my scissors and started cutting open all the boxes right in our driveway because I was so excited. I eventually carried them all inside so I could get a better idea of how they would look in our space and the lighting. From the start, I knew which one I wanted but had to give them all a fair chance. Right away I had it narrowed down to these two. On the left is Treverkchic in Francese and on the right is Creekwood in the color Maple Lake. My only concern with Maple Lake was the size (I wanted something a little longer especially for such a large space, and the busyness of the grain). These ones were a little too grey for me but gorgeous none the less. These ones were again a little too short and a little darker than I wanted. I kept coming back to my top two choices so I brought them into the kitchen separately to see how they looked against the cabinets. I also kept each one in the same spot for a full day so I could see how the different light affected them. I did a poll on my instagram and it was close but the winner was Treverkchic. And that was our winner too! I wanted something light that wouldn’t show much dirt and dust but wanted it to have some good texture and subtle grain to it as well to appear more like wood. And the length was perfect! The samples are actually 6×48 but they also come in 8×48 which is what we ended up choosing. Again, it’s Marazzi’s Treverkchic in the color Francese and it’s oh so pretty! When choosing your floors – don’t jump into it too quick. Let your options sit with you for a while and see how they look in different light. Also, make sure you get a few pieces of each one so you can see the variation in the tile. Every piece won’t be exactly the same, which is what helps it look more like real wood. I also like to google the name of the ones I like and see if I can find anyone who’s used it in their home and has posted pictures. It always helps to see it in a space! Or Materika! I just love the linear grooves on this one – it’s so gorgeous! As a little update – these new floors will be resulting in some major room makeovers. Our family room, dining room and play room are all on the list and I can’t wait to share more about the design plan for each space soon! 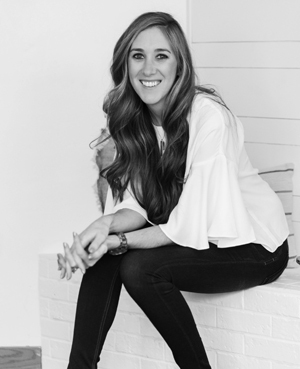 In the meantime you can check out my Pinterest boards – Dining Room | Living Room – and be sure to follow along on instagram for tons of behind the scenes action! 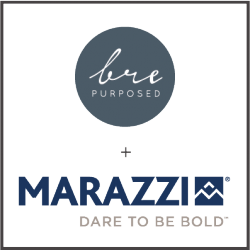 This post is sponsored by Marazzi, but all thoughts and opinions are 100% my own. HUGE thanks to them for providing tile for this project. I love the tile design that you chose! It is indeed very neat and sophisticated looking. Your post literally inspired me to check and look for this kind of tiles for my own home. Thank you for sharing this! These floors are beautiful. They really look like wood! What spacing and grout color would you recommend to achieve a natural wood floor look? I think you have convinced me this is the best choice for our home as well. 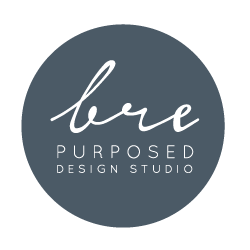 We used an 1/8th inch grout line and I’d recommend choosing a color that matches your tile! I’ll be doing a whole post with tips and tricks soon!